1986: Tandy releases Personal DeskMate for their Tandy 1000 EX. 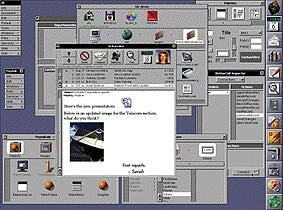 This is the first graphical version of Tandy's previously text-based integrated office package. Apple releases Finder 1.0 for their Apple IIGS ProDOS 16 v1.3 (Later changed to GS/OS) operating system. Earlier versions of ProDOS 16 had a GUI but only a simple launcher application as a shell, and bundled Apple II Desktop/MouseDesk instead.